The Royal Albert Hall is a concert hall situated on the northern edge of the South Kensington area, in the City of Westminster, London, England, best known for holding the annual summer Proms concerts since 1941. Since its opening by Queen Victoria in 1871, the world's leading artists from several performance genres have appeared on its stage and it has become one of the UK's most treasured and distinctive buildings. Each year it hosts more than 350 events including classical concerts, rock and pop, ballet and opera, sports, award ceremonies, school and community events, charity performances and banquets. The hall was originally supposed to have been called The Central Hall of Arts and Sciences, but the name was changed by Queen Victoria to Royal Albert Hall of Arts and Sciences when laying the foundation stone as a dedication to her deceased husband and consort Prince Albert. It forms the practical part of a national memorial to the Prince Consort - the decorative part is the Albert Memorial directly to the north in Kensington Gardens, now separated from the Hall by the road Kensington Gore. The Royal Albert Hall is located in South Kensington, facing onto Hyde Park. 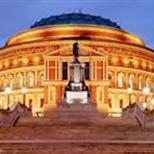 The address is Royal Albert Hall, Kensington Gore, London SW7 2AP. No parking is available at The Royal Albert Hall. Fourteen wheelchair spaces with adjacent companion seats are situated in the Stalls at Ground floor level. There are also six wheelchair spaces in the Circle at sections P, R, V and X and four spaces within the unreserved standing area of the Gallery. Please note that due to the physical limitations of the circular shape of the auditorium, the spaces in the Circle are more suitable for customers with good upper body mobility.